Unlike the fast-paced thriller that is the T20 format where big partnerships are the exception rather than the norm or the slow grind of Tests that often place more emphasis on time rather than merely runs, ODIs occupy a middle ground where a century partnership is a useful yardstick to measure whether a team is doing well or not. While century partnerships in ODIs have become increasingly frequent over the past few years, for one pair to enjoy several such partnerships is usually not easy. But India have been blessed with some world-class batsmen and batting pairs, who have recorded century partnerships with ease. But who has the most century partnerships for India in ODIs? Tied for the fifth spot in the list of most century partnerships for India in ODIs is Rahul Dravid with two different partners. With both Sourav Ganguly and Sachin Tendulkar, Dravid had 11 century partnerships for India in ODIs. 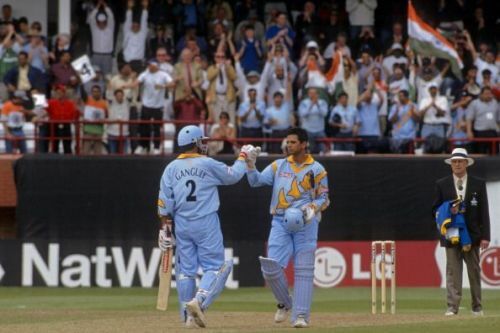 With Ganguly, that mark came in 87 innings, with a highest partnership of 318. The pair of Dravid and Ganguly were incredibly prolific for India in ODIs as the dup amassed 4,332 runs together at an average of 50.37 per partnership. And it was not just the fact that they scored big but they also did so consistently, as evident from the fact that the pair enjoyed 11 century partnerships and 18 fifty partnerships. Not only are they one of only four pairs to have put on 4,000 runs in ODIs for India, but they hold the record for having the most runs by an Indian pair, who weren't openers. Also tied for the fifth spot is the duo of Dravid and Tendulkar. They also had 11 century partnerships for India between them and also hold the national record for the highest partnership in ODIs. A record they have, courtesy of their 331-run stand against New Zealand at Hyderabad in 1999, which was the world record for the highest ODI partnership until it was broken during the 2015 World Cup. In 98 innings together, the pair have more than 4,000 runs between them and also 11 century and 14 fifty partnerships and an average of 44.